Each day we have access to more video formats, mainly due to the increase in the amount of gadgets that allow us to view videos, among which we will be able to find the iPod and iPhone by Apple, the Nintendo DS and the Sony PSP. All these gadgets use similar formats, even though they are all different at the same time, so if we have a video on our computer and we want to watch it on our favorite gadget, we will have to use a converter to have it in the proper format. In the case of the Sony PSP, we will have the option to use PSP Video 9, a free converter specifically developed to convert videos to the format used by the three generations of the portable video game console by Sony. As soon as we start the application, it will allow us to decide for which of the versions of the PSP (1000, 2000 and 3000) we want to convert the video. After selecting this simple premise, the program will open the main window, where we will be able to convert the videos. The formats supported by PSP Video 9 include AVI, DivX, Xvid, FLV (used by the YouTube videos) and VOB, among others. All these formats will be able to be converted to the H.264/AVC format used by the Sony console. 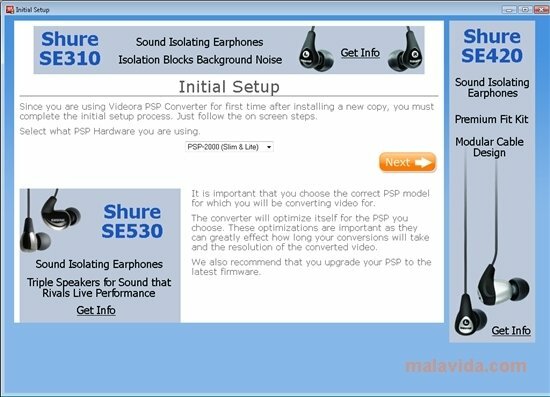 Once we select a video to convert, the program will allow us to choose the image and audio quality, and if we want to try to improve it, at that same time that it shows us a graphic that will indicate if the conversion will be quicker or slower, if the quality will be better or lower and the final size of the converted file. 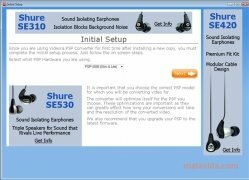 So, if you want an application that will allow you to convert your favorite videos to the PSP format, download and install PSP Video 9.